Preheat oven to 350 degrees Fahrenheit. Line a 13 x 9 x 2 baking pan with non-stick foil and set aside. In a small bowl, stir together the cream cheese, chopped peppers, chopped basil, and garlic till mixed. In a small bowl, stir together the crushed crackers and grated parmesan. Pour the buttermilk in a small bowl. Lay the chicken pieces flat on a large sheet of waxed paper. Put equal portions of the cream cheese mixture in the center of each. Roll the chicken up in a jelly roll fashion. Dip in buttermilk and then roll in cracker crumbs. Place on baking pan lined with foil. Bake for 15 minutes. Remove from oven and drizzle with 1 cup of the marinara sauce. Sprinkle with the mozzarella. Return to the oven for 10 to 15 minutes more or until chicken has reached an internal temperature of 165 degrees Fahrenheit. Meanwhile, prepare pasta according to package directions and drain. Heat remaining marinara sauce. 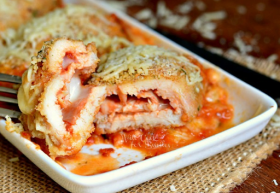 Individual servings should have the cooked pasta drizzled with remaining marinara sauce, topped with the cooked chicken and sprinkled with the shredded parmesan. Garnish with parsley and small peppers if desired. For more information about this recipe and our Grand Prize Winner of the Hungry Holidays Recipe Contest - Deborah Puette, click here.